My parents are taking my two sisters and me to Port Douglas for their 25th wedding anniversary in early Jule. We are really looking forward to it, especially because my sister will be visiting from Spain- I haven't seen her for two years. I've never been to Queensland before and was wondering if any of you had suggestions for a) casual but good places to eat in and around Port Douglas and b) a nice, romantic restaurant, perhaps near the beach (I would like to buy my parents a romantic dinner-alone- on one of the nights). I was there in March this year. I'd recommend Salsa, Harrisons, The Inlet (it's on the inlet). Can't recommend anything romantic by the beach. I only saw a casual cafe by the beach. Also you must have drinks on the lawn at the Pt Douglas Yacht Club. Very, and I mean very, rustic but charming and only locals no tourists. Check out opening hours though as it isn't always open. Morning coffee and internet at Rehap is good. If you fly into Cairns and drive to Port Douglas stop in and see Trinity Beach(rustic cafe opposite the beach) and Palm Cove (up market eating opposite the beach). Emily, I have absolutely nothing to add to this topic as I haven't been to Cairns in over 25 years, but just wanted to wish you all a great trip. If this rain continues (and I really hope it does, we need it), you'll be more than ready for a trip to Cairns by July. My lucky SIL was invited to a wedding in Melbourne 2 weeks ago, and then spent some time in-- "Fort Douglas", "north of Cannes" I thought she said on the phone, but I soon figured it out--she was swooning about the nature--snorkeling with sharks, pandas in the trees! uh huh - you mean koalas. I've yet to see a koala in a tree in the wild. Thought I did once and Bryan came to a screeching halt when I yelled. We backed up but it was just a growth on the tree. Yikes! I hope they were grey nurses. 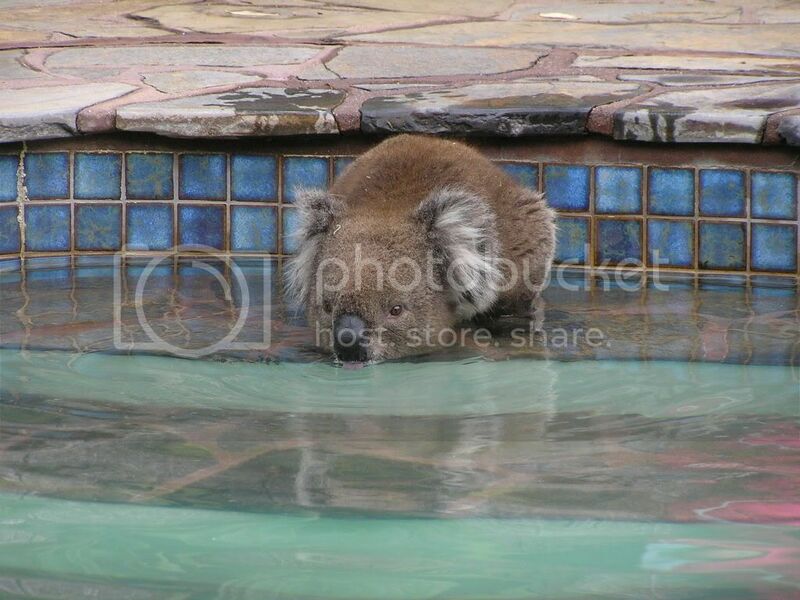 We have regular koala sightings in suburban Adelaide. My parents and their neighbours have had them as visitors in their back yards, and we see them occasionally sitting in trees or on fences. They're not cute and cuddly when you get close to them, but then neither are polar bears. 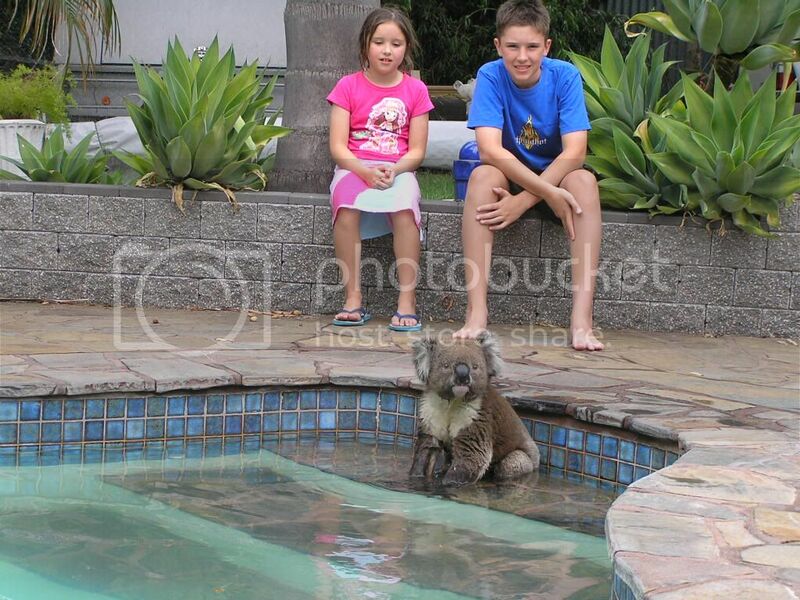 Oops, yes, I meant koala bears! I'm sure the shark visiting was well supervised by guides. The prices were scary, though. And she said All Australians are Happy and Nice--but I knew that. Thanks for your suggestions Barbara- will certainly have to try that Tarte Tatin, sounds heavenly. Yes, Judy, I'm sure I will be well overdue for a bit of warmth by then- there was a layer of frost on my roof this morning for the first time this winter. We have a resident koala on our street too- we see him every now and again. I think he must have got lost because I've never seen one in my area before. Judy that is so cool. They look adorable...but I'm told they aren't really. They do look gorgeous, but I wouldn't want to corner one. Their claws would really do some damage. Not sure about their teeth, but as they are herbivores, they probably wouldn't bite too hard.